Fantasy Football Librarian: Contest updates! Congrats to the big scorers - keep it coming! 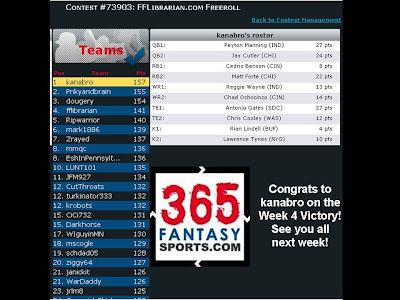 And in my weekly contest with 365FantasySports.com, the big winner of the week was kanabro - nicely done! See the image below for the top contestants and winning lineup. Oh and hey, hey the FFLibrarian came in 4th! If you'd like to prove that you can beat me in FF, sign up for one of my weekly contests with this week's password: book5. I've got three different contests going on so pick one from the contest lobby or choose them all! First we've got the "pick 2" contest that we've been running all along (pick 2 from each position); second, my personal favorite is a contest where you can only pick from those players in the late afternoon games, the Sunday Night and Monday Night games (a second chance game for those who already know they're toast after the first games are done! ); or third, a 375 points cap game. E-mail 365FantasySports.com if you need to refill your points for free.